One of the biggest surprises of the day took place at Benington, where champions Swineshead Institute were soundly beaten 3-0. Matthew Hood, Gavin Bell and Danny Woods were on target in the Taylors Garages Premier Division fixture. Billinghay's Simon Creasey clashes with Old Leake's James Leafe. Goals from Carl Wilson and Jack O’Brien helped Coningsby beat Pointon 2-1. Billinghay Athletic edged out Old Leake 3-2, with the away side’s consolations coming from Steve Green and James Leafe, Green also seeing a penalty saved. Kirton Town were dealt a cruel blow just before kick off when three players failed to show for their away match at leaders Wyberton Reserves. The home side claimed a comfortable 9-1 win. Ruskington Rovers and Fishtoft played out a 1-1 draw. In the Taylors Peugeot Division One, Friskney were missing five key players against FC Wrangle - and the visitors took full advantage to win 3-2. Victor Sibert’s finish and an own goal were Friskney’s consolations. Freiston produced a superb first half display at Old Doningtonians where they put themselves in total command as they held a 5-0 interval lead. The visitors had to play the second period with 10 men after using their one and only substitute during the first half but suffering two injuries. Old Dons came back into the game and they did manage to pull three goals back through Ollie Gedney’s double and a Chris Wing strike, but Freiston’s lively attack still found time to add two further goals to run out 7-3 winners. Freiston’s matchwinners were Perrie Dale (three), Jamie Elston (two), Troy Ayton and Tom Bates. Sutterton put up a spirited display at Woodhall Spa United before going down 7-1. Fosdyke hearts were broken when late Leverton goals from Marc Hipwell and Nathan Rippin saw their lead become a 2-1 defeat. In the Taylors Ford Division Two, two goals from Mitch Bradley helped FC Kirton to a share of the points following their 3-3 draw at home against Sibsey. Josh Brayson hit the other Kirton goal. A Jack Cridland goal wasn’t enough as Fishtoft Reserves lost 2-1 to Coningsby Reserves, with several players away on a stag do. Mareham United went down 8-2 at home to Swineshead A. Tony Webb and Lukas Payne grabbed their consolation goals. Park United recovered from conceding a goal in the first five minutes at Holbeach Bank to record a comfortable 12-1 victory. The goalscorers were Alex Limb (four), Adam Busby (three), Chris Wright (two), Dec Wilson, Ben Dean, and Ryan Huskisson. 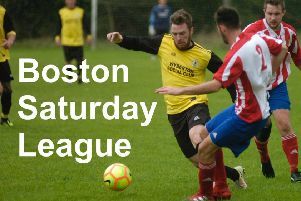 The Taylors Vauxhall Division Three saw Boston Athletic produce a promising first half display in their home match against Old Doningtonians Reserves but, once more, they failed to maintain their form. Andy Barnett (three), Liam Barnett (two) and Scott Hempsall were on target in a 6-0 victory. Pointon A beat Wyberton A 2-1. Spalding Harriers were held to a 2-2 draw at home by Boston Titans and Northgate Olympic put up a spirited performance at Spilsby Town Reserves before returning home empty-handed following a 1-0 defeat. FC Boston conceded 12 times against FC Hammers, who moved up to third following goals from Christian Taylor (four), Ian Ingamells (four), Jamie Taylor, Dan Avison, Reese Snade and Alan Morley. In the Main Ridg Take Away Reserve Cup, Kirton Town Reserves, Leverton Reserves and Swineshead Reserves all booked their places in the secondround. Kirton Reserves defeated Pointon Reserves 6-2 at Graves Park. Leverton edged out Benington Reserves 2-1 while Billinghay Reserves, from Division Two, took First Division Swineshead Reserves to extra time before bowing out 5-4. Mark Ledger and Tom Ebberley both scored twice in normal time as the game finished 4-4 after the usual 90 minutes. Swineshead’s James Bexon then popped up with the winner.